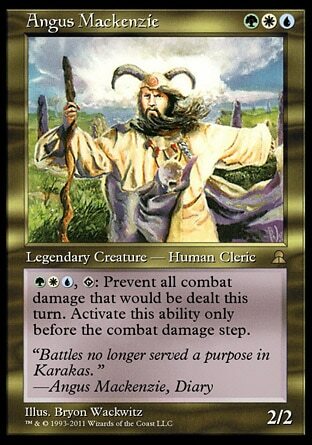 Unlike other Magic the Gathering online software, Cockatrice allows users to save replays of their games. This is tremendously helpful not only to help test everybody's decks, but also to provide detailed game reports. Although it is rare to find a true casual Commander game on Cockatrice, they can happen sometimes, like the one that I'm about to report you today. This is a very detailed report about an amazing game that I had last night playing with Vela the Night-Clad as my commander. Feel free to comment what you thought about this game, or if you would have made a different decision at any time. Lazav reveals a Chancellor of the Spires. Angus' graveyard: Elfhame Palace, Bant Charm, Simic Manipulator, Plains, Asceticism, Prophet of Kruphix, Wrath of God. Vela's graveyard: Island, Sai of the Shinobi, Swamp, Baleful Strix, Quag Vampires, Dimir Aqueduct, Invisible Stalker. Vela's hand: 2x Swamp, Tainted Isle, Kederekt Leviathan, Plea for Power, Nezumi Graverobber, Silent-Blade Oni. Vela: draw Riftwing Cloudskate, play Swamp. Vela: draw and play Darkslick Shores, suspend Cloudskate. 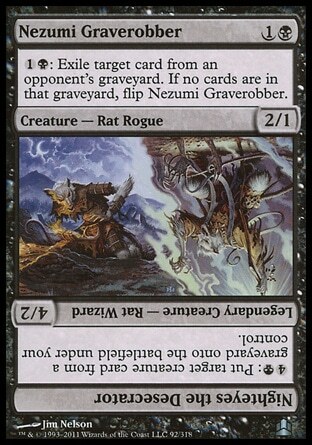 Vela: draw Life's Finale, Swamp, Nezumi Graverobber. Angus: Hinterland Harbor, Darksteel Ingot. Vela: draw and play Reliquary Tower, attack Lazav with Graverobber (38). Angus: Selesnya Sanctuary, moving Island to hand. EOT Graverobber exiles Prophet of Kruphix and Wrath of God. Vela: Cloudskate returns Mindcrank to hand, draw Sygg, River Cutthroat, play Tainted Isle, attack Angus with both creatures (36), cast Sygg, draw Liliana's Specter at end of turn. Lazav: Swamp, Jace, Memory Adept, targets me with second ability (2x Swamp, 2x Island, Inkfathom Witch, Halimar Depths, Dismal Backwater, Higure, the Still Wind, Quickling, Shizo, Death's Storehouse), Lazav is copying Higure. Angus: casts himself, plays Simic Growth Chamber returning Hinterland Harbor. Discards Arctic Flats during cleanup. Vela: draw and cast Dire Undercurrents, attack Jace with Cloudskate (2). Lazav: Salt Marsh, targets Angus with Jace's 2nd ability, Angus responds with Eladamri's Call, searching for Seedborn Muse (Wargate, Telemin Performance, Standardize, Spell Crumble, Cloud Cover, Blatant Thievery, Azorius Chancery, Privileged Position, Iona, Shield of Emeria and Island all go to the graveyard). Lazav is now copying Iona (a reminder that her ability doesn't work this way). Casts Demonic Tutor searching for Sol Ring, casts Sol Ring and Mindcrank. Angus: Hinterland Harbor, Seedborn Muse. Vela: draw and play Minamo, School at Water's Edge. Graverobber exiles Demonic Tutor, transforming into Nighteyes the Desecrator (which can be incredibly scary when you have a milling strategy at the table). Attack Jace with Cloudskate, which is blocked by Lazav (I forgot he was copying Iona ). 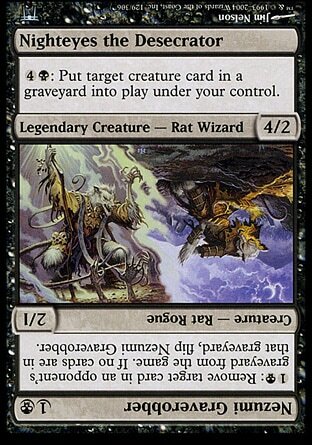 Cast Liliana's Specter, targeting Angus with Undercurrents (Lazav: Chancellor of the Spires; Angus: Island, Peacekeeper). Lazav: Island, Animate Dead, targeting Iona naming blue. Jace targets Angus with his first ability (3), milling Fountain Watch. Casts Darksteel Ingot. Attacks me with Lazav (copying Iona), I block with the Specter. Casts Geth's Verdict targeting Angus (35), which sacrifices himself. Angus: Regrowth, returning Privileged Position and casting it immediately. Vela: draws and plays Swamp. Lazav: Jace targets Angus with 1st ability (4), Angus dumps an Island. Plays Swamp, Geralf's Mindcrusher, targeting me (Ashling, the Extinguisher, Dark Hatchling, Sower of Temptation, River of Tears, Island). Attacks me with both Ionas, Nighteyes animates Baleful Strix, I draw Eye of Doom and Notorious Throng, Lazav discards Mind Grind (0 cards in his hand, now), Strix blocks Lazav (34). Mindcrank mills me Skullsnatcher, Island, Nephalia Drownyard, Ninja of the Deep Hours, Command Tower and Throat Slitter. Angus: Halimar Depths, casts World Queller. Vela: Topdecks and plays Temple of the False God. Angus: Queller triggers on planeswalker, casts Stuffy Doll naming Lazav, casts Pariah on Stuffy Doll (combo!!). EOT Nighteyes animates Riftwing Cloudskate (I draw an Island) targeting Privileged Position. 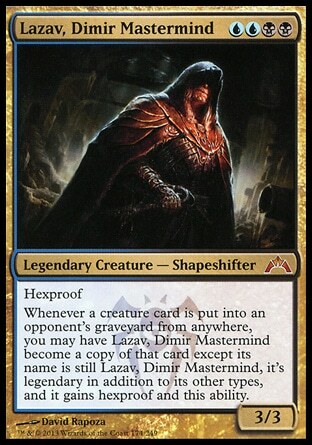 Lazav: casts himself, casts Mind Sculpt on Angus, milling Island, Propaganda, Gwafa Hazid, Profiteer, Forest, Graypelt Refuge, Angel of Glory's Rise and Swiftfoot Boots. Lazav becomes a copy of Angel of Glory's Rise. He attacks Angus with Iona, but forgets Stuffy Doll has Pariah, so (32). EOT Nighteyes animates Sower of Temptation, targetting Iona, Dire Undercurrents draws me Bite of the Black Rose. Nighteyes targets Angel of Glory's Rise, exiling Geralf's Mindcrusher and returning Ninja of the Deep Hours, Invisible Stalker and Higure, the Still Wind. Angus: casts Austere Command, destroying all creatures In response I animate Liliana's Specter, making Angus discard his last two cards (Privileged Position and Tunnel Vision). Vela: draws Crystal Shard, casts Bite of the Black Rose sickening Stuffy Doll, casts Scythe Specter. Angus: plays Sungrass Prairie, casts himself. 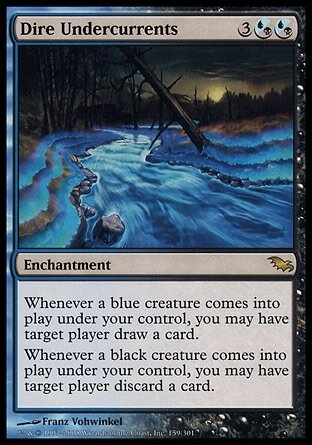 Vela: draws and plays Swamp, attacks Lazav with Specter (28), making him discard Traumatize (23). Cast Crystal Shard and Vela the Night-Clad, drawing and casting Bitterblossom. Vela: makes a token (33), Mindcrank mills Island, draws Walker of Secret Ways. Specter tries to attack Angus, but in vain. Cast Walker, draw Creeping Tar Pit, play it, return Walker to hand, making Lazav (22) and Angus (34) lose 1. Mindcrank mills an Island for Angus. Lazav: attacks Angus with both creatures (29), mills Platinum Angel, Greater Auramancy, Plains, Sejiri Refuge, Genesis Wave. Lazav is now copying Platinum Angel (obviously). Casts Geth, Lord of the Vault. Angus: casts Myojin of Seeing Winds. Vela: make a token (32), mill Mistblade Shinobi, target Lazav with Dire Undercurrents, discarding Island. Draw Sudden Spoiling. I start doing math and realize I can win on this turn, so here it goes. Target Myojin with Crystal Shard (Angus can't pay), he responds by drawing 10 cards, animate Creeping Tar Pit, attack Angus with everything, he blocks Vela with himself (21). Geth reanimates Sygg and mills Augury Owl and Solemn Simulacrum. 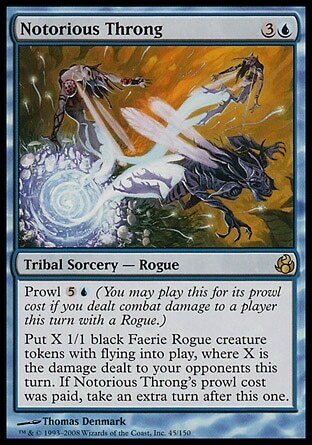 Cast Notorious Throng for its prowl cost (Bitterblossom makes faerie rogues ), making eight tokens. Make a token (31), mill Bojuka Bog, attack Angus with Specter and Vela (13), and Lazav with all the tokens (11). Cast Kederekt Leviathan (he has been lying in my hand since the beginning of the game), bouncing everything. Vela triggers 13 times, enough to win the game. Last edited by Maluko on 2014-Oct-06 12:33 am, edited 1 time in total. Maybe I'm missing something, but I think this game ended in a draw as soon as that guy attacked Angus. You said there was a Stuffy Doll naming Angus and Angus put Pariah on it... that means whenever damage is dealt to the doll OR the player, the doll infinitely damages itself with no way to break the loop, ending the game in a draw. 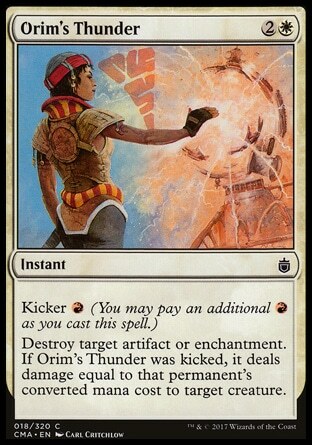 Angus: Queller triggers on planeswalker, casts Stuffy Doll naming Angus, casts Pariah on Stuffy Doll (combo!!). EOT Nighteyes animates Riftwing Cloudskate (I draw an Island) targeting Privileged Position. Maluko, I believe this is what Sid is referring to. I believe it is just a mistype, but obviously if the above did happen then Sid is correct about the infinite loop. My apologies! It is corrected now.